This modest brown- and red-brick building has one of the most graceful and unusual cornices in the city. Cornices are protruding rooftop elements that cap a building's facade composition. They are horizontal exclamation marks that separate a building from the sky from a pedestrian's viewpoint. They are the pronounced precipices that are very important accents, especially in an urban setting where most buildings are built to uniform street walls and are often seen from severe angles rather than directly. Although many fine cornices in the city are very detailed, often in Italian Renaissance-style, they generally are straight-edged, even though some have curved facades beneath them and some have scalloped forms. Here, the architects, Schwartz & Gross, have created a gently undulating roofline of great grace. "This 16-story apartment house is crowned with terra-cotta reminiscences of Egyptian-styled papyrus stalks (don't confuse this with the 19th Century Egyptian Revival Style, of which very few examples remain in the city)," wrote Elliot Willensky and Norval White in their fine book, "The A.I.A. Guide to New York City, Third Edition," (Harcourt Brace Jovanovich, 1988). The combination of the facade's rich, dark color and the rather delicate detailing of the cornice is surprising and spectacular. The most famous Egyptian-style building in the city was the Tombs, a jail and court building, now demolished, in Lower Manhattan. Of existing buildings, the Pythian condominium building on 70th Street east of Broadway is full of Egyptian-style elements in a quite bold, even gaudy, manner. Here, however, the motif is quite muted and one wonders what would be the visual effect if the cornice "papyrus" were covered in green glazed terracotta. This building, which has protruding air-conditioners and inconsistent fenestration, has two small curved balconies above its canopied and landscaped entrance. "The tapestry brick enriches the viewer's experience close to eye level," authors Willensky and White noted. The two-story white stone entrance surround is a bit puzzling since it does not pick up the wavy papyrus motif of the rest of the building. .The building was erected by Edgar Levy in 1929 and converted to a cooperative in 1971. It has 103 apartments. 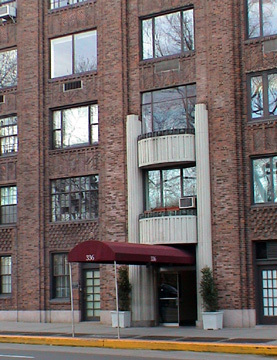 Schwartz & Gross was one of the city's most active architectural firms specializing in apartment buildings before World War II. 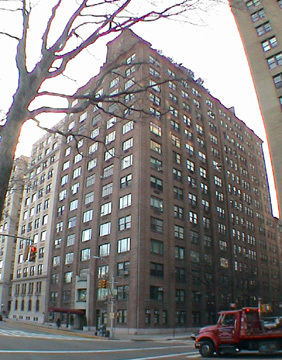 The firm also designed the Brentmore at 88 Central Park West and most of its designs were more conventional, albeit attractive. It was particularly active on Park Avenue where its buildings include 470, 525, 885, 888, 910, 911, 930, 941, 970, 983, 1045, 1070, 1095, 1125 and 1165. 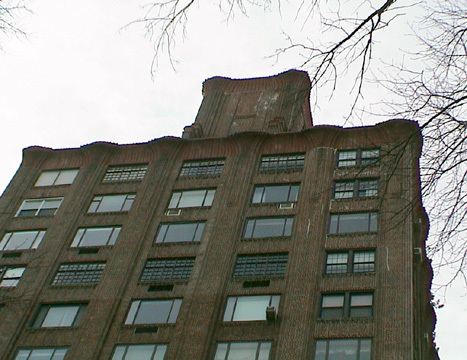 This is one of several very interesting buildings in a pleasant stretch of Central Park West in the 90's. It is two blocks south of a subway station and cross-town bus service at 96th Street.